regular Artisan Bread Recipe that I also use for Baguettes. Either the Yeast Version or the Sourdough Version. I've finally baked a pizza that makes me happy. Moe and Matthew have always loved homemade pizza. But I've been ambilivent about homemade pizza. 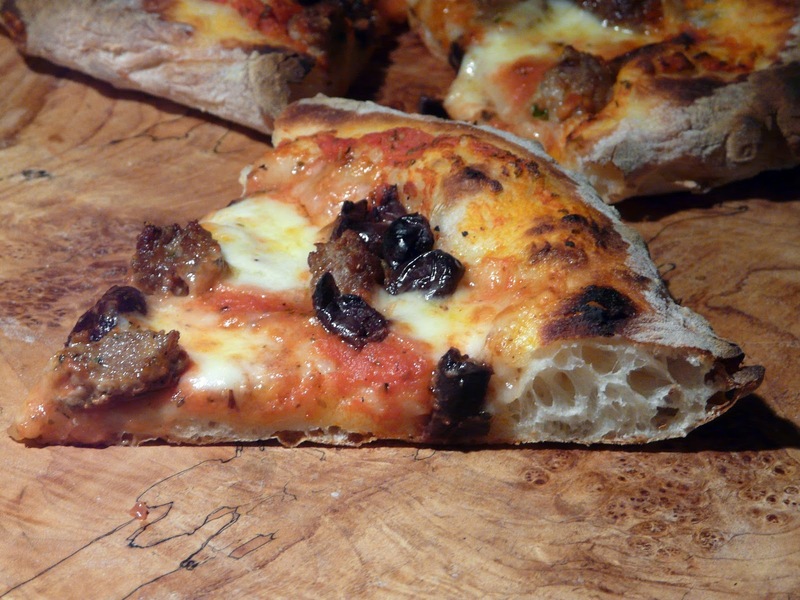 Pizzeria restaurant that bakes thin crust pizzas in a wood fired oven. making one change - I like a more hydrated dough so I increased the 720g of water to 820g for the pizza dough. but they use slightly less yeast or a much longer rise. I didn't want to wait six hours for the last rise so I used the bread recipe instead. Besides, now I have half a batch of bread dough in the fridge that I will make either another couple of pizzas from or another loaf of bread. The biggest change I made was to how I normally bake pizza. Instead of the pizza stone being near the bottom of the oven, I followed Ken Forkish's instructions to place the stone near the top of the oven, eight inches from the broiler. In my oven this is the rack position second from the top. 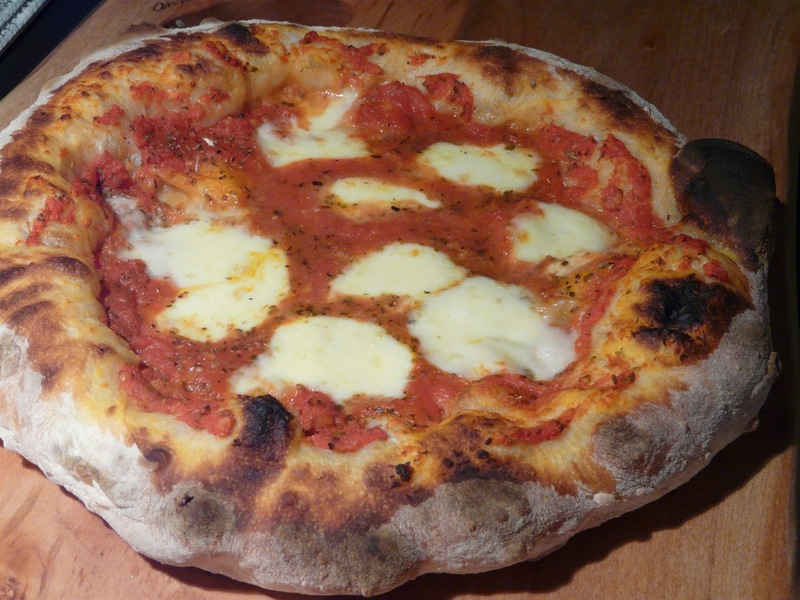 Preheated to 550°F (the highest setting on my oven) for an hour, and then prior to sliding the pizza on to the stone, the surface is given a boost by turning on the broiler for five minutes. 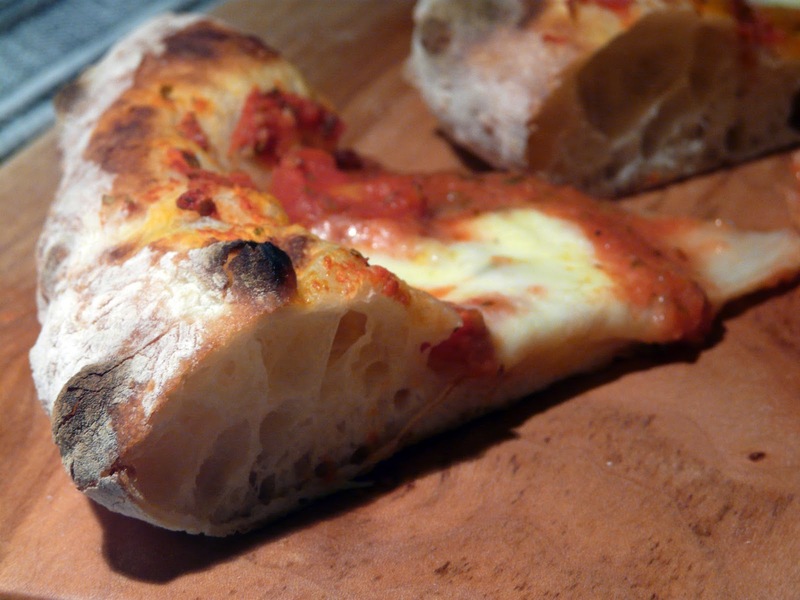 and the pizza is slid on to the stone. Baked for five minutes and then broiled for two minutes. 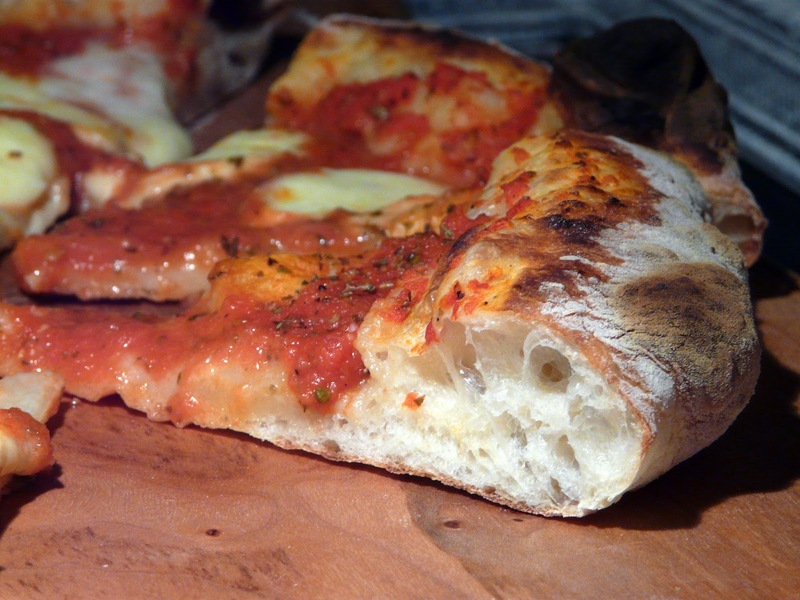 This results in the perfect pizza crust. Brown with little chard bubbles. I baked two pizzas. The first was plain, just topped with sauce and fresh mozzerella. 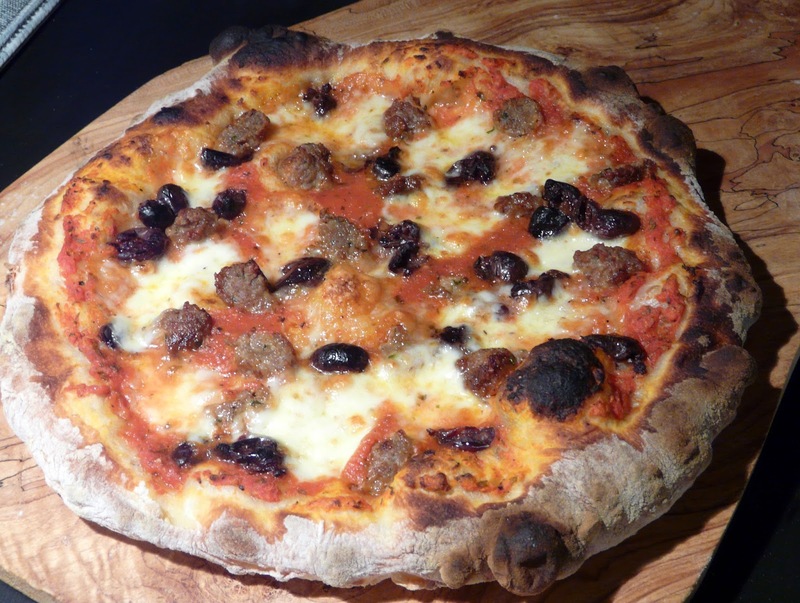 The second topped with the same sauce and cheese and with homemade Italian Sausage and black olives. This pizza set the bar high. Moe is going to expect all future pizzas to meet this standard. Oh no! I was so excited and want this pizza, but no recipe! Darn! Looks exactly like a pizza I would love! Yikes I used to think your others were perfection..! Ann, I'm going to try the baking technique the next time I make pizza. It sounds so easy for such spectacular results. Matt was trying to explain this new baking method to me since our oven can't hold high even heat. He'll have to try this out next time! Dana, I think it will work even if you can only get your oven up to 450° or 475°F. It just might take slightly longer to bake before finishing under the broiler.